In an interview with the British journalist Piers Morgan, the brilliant physicist Stephen Hawking commented that "People who boast about their I.Q. are losers." Would it follow that the more a person boasts the bigger the loser? If so, Donald Trump may well be the biggest loser who ever tweeted. Trump's White House doctor Ronny Jackson, in true Trump fashion, stated that Trump scored exceedingly well on the Montreal Cognitive Assessment and has “no cognitive issues whatsoever.” A 10 minute test designed to screen early signs of dementia is not conceivably adequate to evaluate Trumps' mental issues, which are complex and evidenced in everything he says and does. Not failing to draw a cube or count down by 7 cannot even remotely be described as doing exceedingly well. Someone who is unarguably a pathological liar, narcissistic, a dictator, paranoid, sexually abusive, inconsistent, petty, hypersensitive to criticism, vengeful, unethical, and racist like Trump can be seen by anyone without blinders or Republican-base filters to have serious mental problems insofar as their fitness for leadership of the free world. At the very least, the "no cognitive issues whatsoever" is pure white-washing of the many problems this man evidences on a daily basis to anyone whose job does not depend on buttressing Trump's runaway over-inflated ego. Trump frequently reiterates claims to his intelligence: that he is "like really smart" and "a very stable genius." It doesn't take a genius to understand the difference between a cognitive test and an IQ test, or the difference between cognition and intelligence. Neither Trump nor the White House doctor who administered the cognitive test could be labeled genius, but Trump's incessant boasting of his IQ does qualify him as a loser and Doctor Jackson's :no cognitive issues whatsoever" classifies him as a flunkey. 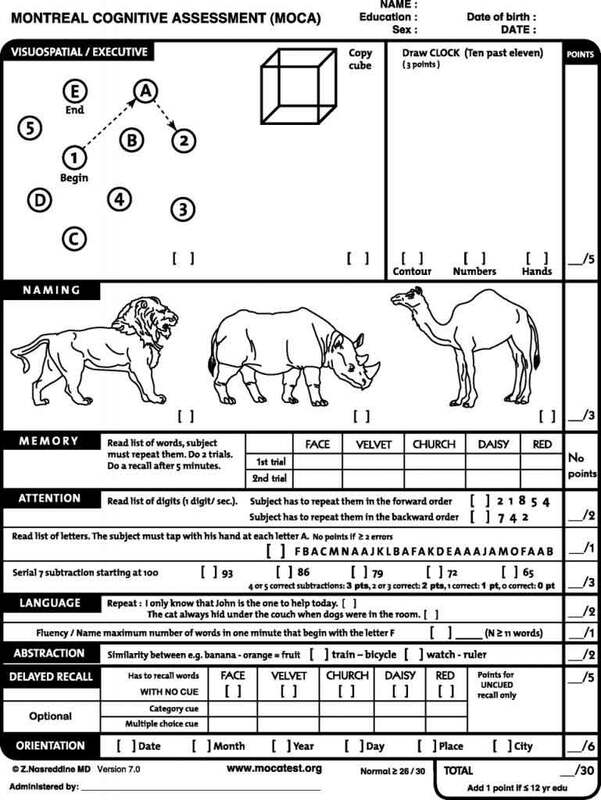 Trump scored 30 out of 30 on the Montreal Cognitive Assessment used principally to detect early signs of dementia signaled by such failures as an inability to identify familiar objects. Most people over 65 who take this test pass with a score of 27 or higher. Again, this test does not reflect how smart a person is, just whether the processes by which information is normally acquired in a functional human being have already been compromised alarmingly or not. This was not an IQ or intelligence test; it is a simple 10 minute screen to detect possible problems in processing information such as remembering the address where one lives. People who fail this test may need assistance for daily living and this is what the test was designed for and should be used for. It does not give Trump a pass on his mental state and no one should be confused or reassured by his passing with 30 points out of 30. It just means he can find his way to the golf course without assistance. Cognition is a process, whereas intelligence reflects how well that process has worked is working, and is likely to continue to work. Intelligence reveals what has been retained or learned, knowledge, understanding, reasoning, retention of information, and skills. Intelligence, skills, and knowledge of abstract concepts are shown in how what has been learned is applied to living. Intelligence thus embodies and reflects such cognitive processes as perception, attention, and remembering. The leader of the free world should, indeed, not only be able to distinguish a lion from a camel (see the test below) or provide in one minute's time at least 11 words beginning with a given letter, but the president of the United States should-- more importantly--be able to pass a more specific test: to distinguish by cause and effects the first Gulf War from the second; he should be able to name all bodies of land and water bordering Israel and not only draw a picture of a clock showing ten minutes past 11 but a clock showing two minutes 30 seconds to midnight with an explanation of how his tweets and policies move the second hand of that clock. To be a good president, a person needs excellent cognitive functioning as well as experience, knowledge of the world, stewardship, and discretion.That person should be, as a rule, honest and truthful and not distort data or live in a world of hyperbolic unreality, where biggest best most ever and all are the most commonly used adjectives and adverbs to describe what is happening. 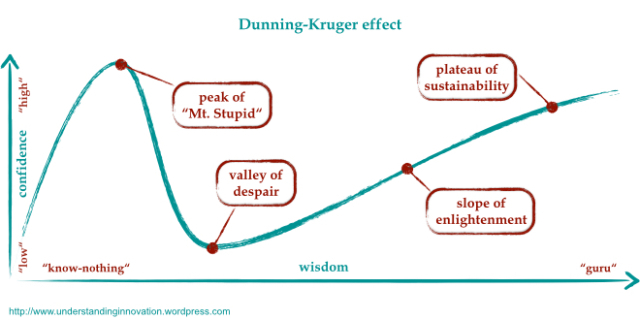 The above said, Trump may indeed be the world's best at one thing: a breathtakingly perfect embodiment of the Dunning-Kruger effect, which shows and explains the inverse relationship between how confident one is in one's own superiority and abilities with one's actual demonstrable areas of expertise. The curve below shows that the confidence a person has in being right or skilled varies inversely with their actual performance up to the level of expertise, whereupon high skills and high confidence match up. While Trump seems to be a skilled salesman, with some knowledge of beauty pageants and reality shows, those skills do not extend to the intelligence, knowledge and skills required required by the leader of the free world to effectively govern and lead, including cultural literacy, knowledge of world ecosystems, governing systems, vocabulary, geography and all complex systems. If a hermit is a pathological liar, defensive, narcissistic, etc, who cares. But if the person who is governing is guilty, we have a problem. Not to continually call Trump out for his lies, coyness about what he is really doing and why, and consistent change of policies is to be complicit. His base won't call him out, and those on his payroll are unlikely to challenge him. Many Republicans will defend him or ignore his mania in the interest of what they consider the greater good. But the "greater good' may be a trap of Hitlerian magnitude when big business and big coal trump clean water and soil as well as cause irreversible damage to ecosystems worldwide. This tendency to defend, overlook and ignore Trump's unacceptable behaviors is compounded by a suite of cognitive biases that affect most people to varying degrees, but in a defensive, insecure narcissistic psychopath like Donald Trump, could push the second hand of the Doomsday Clock to midnight via the Big button (nuclear football). Once an opinion is formed and the mind is "set", this mindset frames incoming information in such as way as to confirm that opinion or perception. We are biologically programmed to enjoy being right, which sometimes requires that others also think we are right. We dislike being wrong and can passionately defend our beliefs and values by dismissing contrary inputs and avoiding conflict by staying in groups of like-minded people. Trump's base is largely composed of uneducated older white men (and women) who like the fact that he acts like a child and talks like an illiterate, i.e., just like they do. Trump reinforces the tendency of this base to ignore data and information such as climate change that threatens their own beliefs and desires for the world to run on coal and coca cola. This is unlikely to change, so agents of change need to concentrate not on changing Trump or the opinions beliefs and behaviors of his base, but on those at the fringe of Trump's base, those who voted for an outlier because he was not the establishment, those who did not choose a man but chose not to perpetuate the establishment.